Happy Joe Cain Day to everyone around here! Happy Valentine’s Day to the rest of you! I know a lot of people hate Valentine’s Day but I actually kind of love it. Not because it’s a day of love blah blah blah but because it’s an excuse to put hearts on everything and I heart hearts. I really didn’t want to do too much for V-Day (Hello lazy!) but I did want to use these cupcake wrappers and the sprinkles that I snatched up as soon as Target put their Valentine’s stuff out. So I decided on plain vanilla cupcakes and some cinnamon buttercream for a little spice. The cupcakes were amazing. The cake was so soft and delicious, and the cinnamon buttercream is my favorite. I wish someone had told me how life changing cinnamon buttercream is. I’m already thinking about the next cake I’ll pair with it. Transfer to a wire rack to cool completely. Repeat process with remaining batter. Beat butter until light and fluffy. Add sugar a 1/2 cup at a time until completely incorporated, adding up to 4 tablespoons of milk when the icing gets to thick. Add vanilla and cinnamon and beat until just combined. 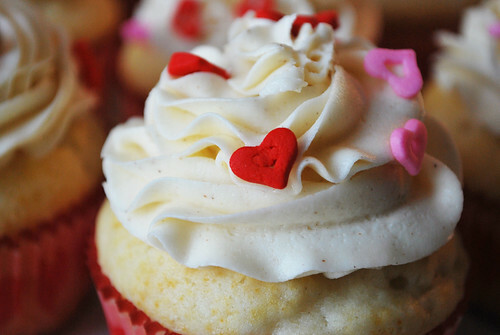 19 Responses to "Vanilla Cupcakes with Cinnamon Buttercream"
.-= Katie´s last blog ..Double Melissa =-. .-= Joy´s last blog ..The Lighthouse Victoria Point – Fantastic Fish and Chips =-. 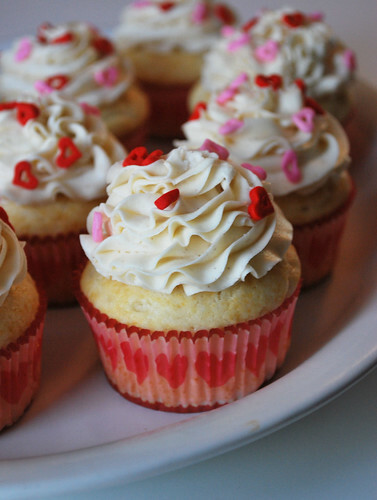 These cupcakes are perfect! Wow. You need to teach me how to pipe frosting haha. These cupcakes sound amazing and look beautiful. Vanilla + cinnamon is a heavenly combination. Yum! .-= Liz´s last blog ..Love is in the Air =-. .-= megan´s last blog ..Giant Oatmeal Chocolate Chip Cookies =-. .-= Eliana´s last blog ..Coconut Cake with Chocolate Chunks and Coconut Drizzle =-. how many does it make, one dozen or 2? 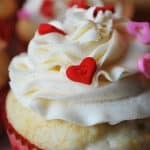 Will this icing recipe cover all 30 cupcakes (piped)? What’s the temperature that you need to preheat the oven at in degrees celsius? I would be 162 degrees Celsius. Thanks for commenting! You’re cupcakes are so perfectly round! Mine never turn out that way; I’d love to know what you do to help them bake up like that! I always “overfill” my baking cups just a bit and I think that helps them get that nice round shape. Like, if it says 3/4 of the way full, I do just under all the way full. Sometimes it makes a mess but when it works out, you get those big, beautiful cupcakes. beautiful decorated! what frosting tip did you use to decorate with?